Public libraries have dealt with the issue of public access computing for many years. The struggle between safe computing usage and access to information will likely not go away. Newport News Public Library System dealt with this conflict by providing computer kiosks that exclusively access their online catalog, providing safe and secure browsing with access to the libraries’ extensive online and offline collection. 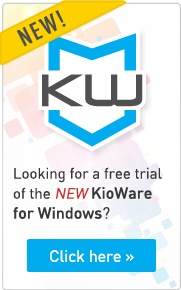 Try our free demo: Download a trial of KioWare Lite for Windows to try it out for yourself. The computer kiosks were installed at Pearl Bailey Library, Main Street Library, Virgil I. Grissom Library, and South Morrison Family Education Center. The kiosk hardware was integrated within the Newport News system with aid from Library Information Technology Analysts James Messimer and Dave Summers. KioWare system software was used to provide OPAC (Online Public Access Catalog) browsing stations without the network security risk inherent in allowing internet browsing on public computers. Using a standard Dell all-in-one PC with Touch Technology, the computer stations allow users to enjoy a bookstore like feel while searching for library materials. Fifteen computer kiosk stations were installed at the four public library locations. The kiosks were configured to access the Newport News Online Public Access Catalog (OPAC) website at newportnewslib.org. KioWare was configured to limit usage to only OPAC specific web pages. Future plans may include expanding the kiosk deployment into tablet devices and mobile browsing stations, increasing availability of the stations (and the catalog) for users throughout the library system. According to Alexandria Payne, the Digital Services Manager for Newport News Public Libraries, "KioWare has allowed our department to focus more on touch technology integration within our standard public services delivery model. Through KioWare, the management, or 'how to' aspect is made effortless, and staff can focus on actually implementing and using the technology to better effect. The library can simply offer access without undue restrictions placed in an attempt to alleviate security concerns, ultimately accomplishing a core strategic objective." View additional case studies about KioWare and how kiosks can help your organization here. You can also download a copy of KioWare Lite for Windows, the product used by Newport News Public Libraries, for a free trial. Not sure which product is the right one for your library use? Visit our comparison chart to help in determining what features are avaiable.